Clay. Late 5th — early 4th centuries BCE. Height 7.5 cm. Saint Petersburg, The State Hermitage MuseumInv. No. Б. 7014. Unknown; from the Bobrinsky collection, acquired in 1931. Side A represents a naked athlete taking part in a torch race with a burning torch in his left hand. “The torch he bore with rapid steps in this sacred contest played out among young men in memory of the fire stolen by Prometheus...” (AP VI 100). He wears a wreath and is running towards the right. On the other side, the goddess Athena appears with all her attributes: shield, spear and helmet. 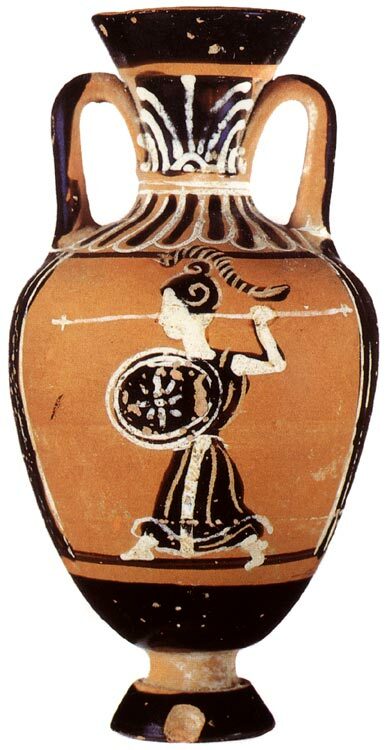 The statue of Athena represented in her “Promachos” type (she who fights in the front line) decorated the amphora awarded to the victors in the Panathenaic Games. K. S. Gorbounova, The Attic black-figure Vases at the Hermitage, (Leningrad, 1983) no. 193 p. 213. © 1993. Photo, text: Olympism in antiquity. Olympic Museum Lausanne. Bertelsmann UFA. Industria Gráfica S. A. Barcelona, 1993, p. 60 cat. no. 3.